Kentucky brides, this one’s for you. When envisioning your dream wedding, gorgeous wedding florals undoubtedly have a spot on the list of must-haves. To help you create your ideal wedding florals, we’ve put together a list of some of the wedding florists in Kentucky! 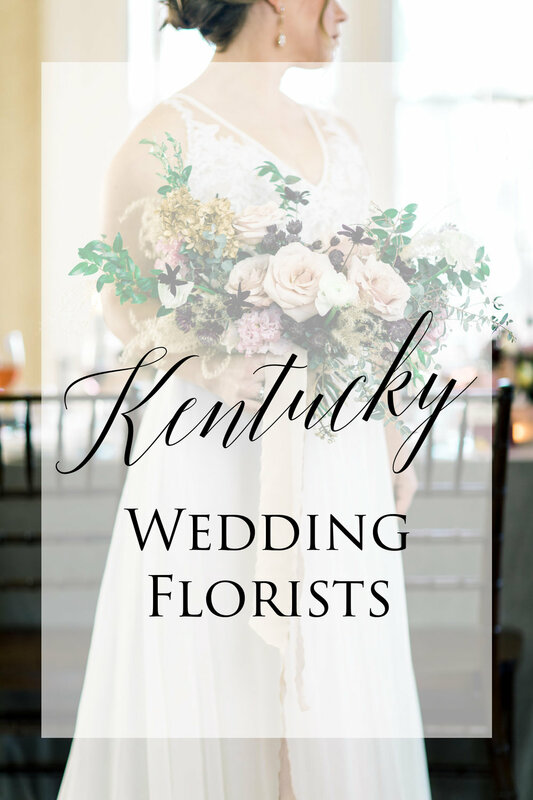 So if you're looking for a Louisville wedding florist, Lexington wedding florists, or a florist that can travel to your city in Kentucky, take a look at our list below! Focused on accentuating the beautiful florals that nature has to offer, Roots Floral Design creates organic bouquets, garden-style centerpieces, and ceremony installation designs for weddings. The owner and florist behind the designs is Kaytee, and we've even had a chance to work with her first-hand! She serves couples in the Lexington and Louisville areas, and even extends to Columbus and Cincinnati, Ohio. Another fantastic wedding florist company we know personally is State & Arrow. Owned by two best friends, Adria and Jamie. They primarily focus on garden-style florals and are a full-service wedding floral design studio. From concept to installation and break-down, you won't have to stress at all with this duo on your side for your big day. The duo behind this Louisville wedding florist team are here to make sure every detail on your wedding day is just as dreamy as the next. Based in Louisville, Rose and Honey Floral is perfect for any bride who’s looking for one of a kind floral arrangements as well as enthusiastic designers to make sure the big day is seamless. If you’re a Kentucky bride looking to go big or go home with your wedding florals, look no further than Lovely Leaves. Their signature style features big statement blooms like peonies, as well as greenery and textured floral accents. Brides who are looking for centerpieces that "wow," or bouquets that make an entrance, the team behind Lovely Leaves has you covered. With 62 years of experience under their belt and countless celebrity clients, Carol Lynn Events is a tried and true florist. For the classic bride who’s planning an elegant wedding, Carol Lynn’s floral shop can provide the best styles and designs to turn your visions into a reality. Based on Main Street in downtown Lexington, this florist serves Lexington and the surrounding areas. From accented floral decorations to large centerpieces and hair accessories to bridal bouquets, Doug Smith Designs offers it all. Based in Lexington and serving the state of Kentucky, this floral design and events team can create beautiful floral pieces as well as provide both full and month of event coordination. Jeanie Gorrell, the florist behind the designs, has 20 years of experience creating work for weddings and events in the Kentucky area, including the Kentucky Derby! No matter your wedding style, whether it’s rustic, vibrant, preppy, or romantic, Jeanie Gorrell can create a personalized floral arrangement that’s sure to represent your theme. We’d love the opportunity to be your photographers. Reach out to us online We look forward to hearing from you!